Besides producing its own range of Sound Cards and MP3 players, Creative is also the original equipment manufacturer for many technology brands in the market. For example, the Acer Predator line of desktop computers uses Creative's Sound Blaster X-Fi Titanium while the Asus's Maximus II uses the SupremeFX X-Fi Audio Card. Auzentech also implemented the X-Fi technology in its own Auzentech Prelude 7.1 Soundcard. However, one of the more significant partnership is the one with Dell. 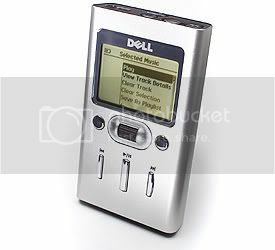 Creative's partnership with Dell goes all the way back to 2005, when Creative manufactured the Dell Digital Jukebox (or Dell DJ) for company. And today, Dell's range of Inspiron laptop's in-built webcam is provided by Creative and now on Dell.com, you can customise your laptop with intergrated Sound Blaster Audigy or the latest Expresscard X-Fi Notebook Sound Card. 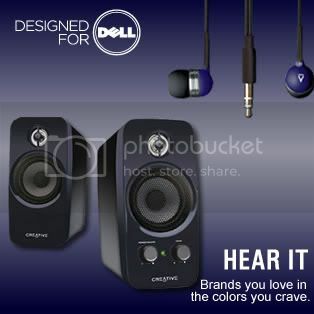 It also customised its Inspire T10 speakers and EP-630 to match Dell's colorful range of laptops. We would love to see the Creative brand logo on more products like PC, laptops and 3rd party soundcards. Not only will this help Creative increase its brand awareness, it will also provide additional source of revenue and really, the possibilities for OEM are endless. Are you more inclined to buy a product that has a Creative OEM parts? Tell us in the comments section! 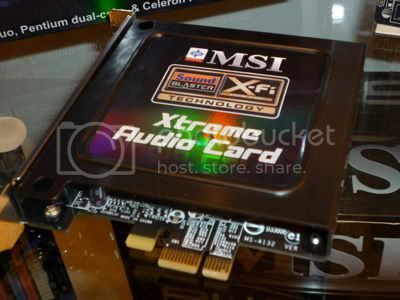 Update: One of our readers, Gerii, also pointed out to us a Creative/MSI Xtreme Audio Card spotted at the Games Convention 2008 in Leipzig and provided us an image of it! There are (were) also some Notebooks from MSI with Creative soundchips. I also found this* at the GamesConvention 2008 in Leipzig, looks like exactly the same as the soundcards bundled with the ASUS mainboards, but I don't know if it's out yet..
PS: The visual verification isn't working with Opera 9.6. Actually, its more interesting to see/debate what Creative is going to do regarding upcoming rival, Asus. Is Creative still that dominant? I feel like a traitor, just bought the Xonar DX recently. No one can tell the audio difference yet the price difference is rather obvious. karil: Asus don't compete head-on with Creative as their cord products isn't really pmp/soundcards/webcams etc. I think there's still a difference with the X-Fi, they just need to let more people know about it. No company these days will sell a single product. They will have a niche, just like Creative being in Audio. ASUS is competing with Creative. Numerous online reviews stated that there's no difference. ASUS's line of soundcard are good enough to be an alternative to Creative's. Than again, how far can audio go. I only wish that the Creative shop in Marina Sq has the Titanium FPS for testing. Or did I missed it out? As for the post, I wish to see Logitech and Creative in a single product! That will be awesome as I think those are 2 better companies in terms of Audio. Logitech for speakers and Creative for cards. Earphone wise, I think Creative has a long way to go. Zen Aurvana doesn't seems that great and is miles away from companies like Shure and Ultimate Ears. So I doubt there will be a collaboration. If Asus can do as well, then it has no need to include X-fi in its premium motherboard.